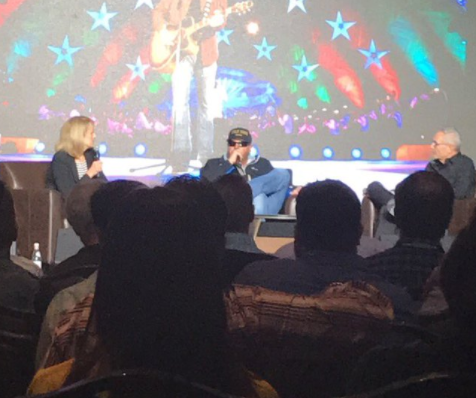 Show Dog Nashville artist Toby Keith helped close out the 2017 Country Radio Seminar on Friday (Feb. 24) with the panel “Toby Keith—My Way,” moderated by All Access Nashville’s RJ Curtis and Scripps/Wichita VP/GM Beverlee Brannigan. BMI’s Leslie Roberts introduced Keith, whose songs have garnered 31 BMI Country Awards and 29 million performances. Keith was named BMI’s Country Songwriter of the Year in 2001, 2004 and 2006. The panel was slated for the day of the annual New Faces of Country Music Show, and Keith recalled his own appearance as a new artist on the show back in 1994, a show that also included then-newcomers Tim McGraw and Faith Hill. From there, Keith discussed the importance of making his own career decision, trusting his own intuition, and the hit-making results that mindset has had on his career. Brannigan asked about Keith’s decision to perform during President Donald Trump’s inauguration, despite opposition on social media. Keith also discussed his strong support for the military and the USO, as well as the influence of his father, who died just months before Sept. 11, 2001. Keith recalled how early in his career, he took direction from music executives, before he began calling the shots. According to Keith, his label at the time wasn’t confident in his How Do You Like Me Now?! album, so he purchased the rights to the album from the label and took it to DreamWorks, which released the project in 1999. Keith advocated for the album’s title track as the first single, a bold choice for radio at the time. When execs at DreamWorks decided to release “When Love Fades” as the lead single, Keith was less than enthusiastic. After “When Love Fades” stalled at No. 33 on the radio charts for three straight weeks, Keith took action. “I just called up 30 radio guys and told them to go with, ‘How Do You Like Me Now? !,’” said Keith. Keith would go on to launch the Show Dog Nashville label in 2005.